In this recipe, you will learn how to change the bounding box settings in 3DF Zephyr, a simple but important feature. This tutorial can be done also with the evaluation version of 3DF Zephyr that can be downloaded here. When reconstructing a 3D model, 3DF Zephyr will automatically calculate the bounding box. A bounding box is defined as the volume in which all points of the reconstruction are defined. Points within those bound will take part in the reconstruction, while off limits will not be reconstructed. 3DF Zephyr will make the best bounding box estimate from the input dataset (If you go back and check tutorial #1, you’ll see that the default bounding box is pretty accurate aside a little noise on the base of the statue) however, you might want to change the bounding box to remove noise or to focus your reconstruction on a specific area of your dataset. For this tutorial, you can use any dataset you’d like. 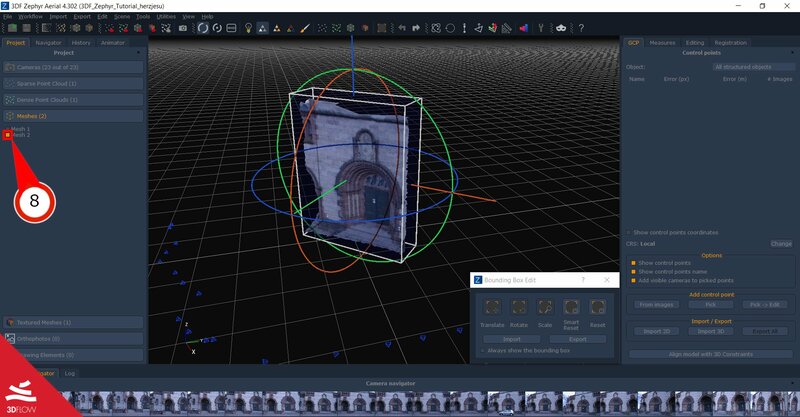 Changing the bounding box is useful for those cases where you want to actually create the reconstruction of a specific area of the photos or when the automatic bounding box generated by 3DF Zephyr is off for any other reason. In this tutorial, we are going to use the Herz-Jesu-25 public dataset and we are focusing on the central area of the scene. You can find it online or, for your convenience, you can download the already made reconstruction from this URL. Open up the ZEP file and you’re ready to go. You can access the bounding box controls either by clicking the “Scene” Menu and then selecting the “Bounding box” submenu or just click “Show bounding box” button (1). You’ll see the bounding box rendered on the scene and the “bounding box edit” (2) tools panel. Remember that everything inside the blue box will be reconstructed. So, what if we wanted to reconstruct only a specific area of our dataset? 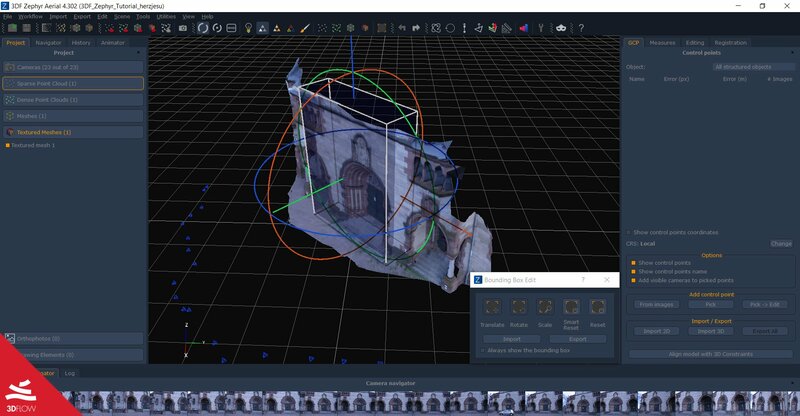 Translate, Rotate and scale the bounding box using the appropriate controls in your scene until the area of interest is contained within the bounding box. (7) Reset : Reset the bounding box to original condition. Once you’re happy with your bounding box, from the workflow menu click “mesh extraction”. 3DF Zephyr will create the mesh – as usual – however, you’ll see that all the points that fell outside the bounding box were left out. After you have completed the mesh extraction, you should see immediately the new mesh. If for some reason you are still seeing the old, full mesh, make sure that you changed the bounding box volume as shown in the screenshot. If you still can’t see the new mesh (or you want to compare it to other meshes, the same process applies), make sure it’s set to visible by checking the relaitve “Visible” checkbox (8). In your scene, you should now see the new mesh extracted to match your bounding box volume. Protip: when rotating the world from the Tools -> Scene -> Scale/Translate/Rotate world the bounding box will rotate as well, which can be annoying sometimes. 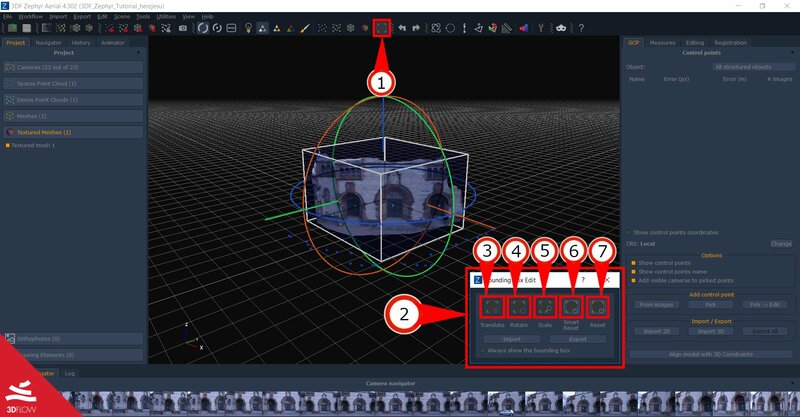 In order to restore the bounding box to a more manageable position, right click the appropriate sparse point cloud from the “Sparse Point Cloud” dock and simply click “Adapt bounding box to points”. Changing the bounding box is easy and can really speed up your post processing phase in your 3D editor of choice. Remember to always check it before starting a reconstruction. The next tutorial will show how mask images in order to remove unwanted areas to minimize error, improve computation speed or to cheat Zephyr in order to be able to move an object. Click here to proceed to the next tutorial.